Scientists have developed a unique silk-based tissue chip that can be used extensively for drug testing and can better represent human tissues, compared to the present generation of chips. This silk gel chip enabled the research team to prevent most of the issues associated with current devices and could even be used as an implantable treatment in the future. 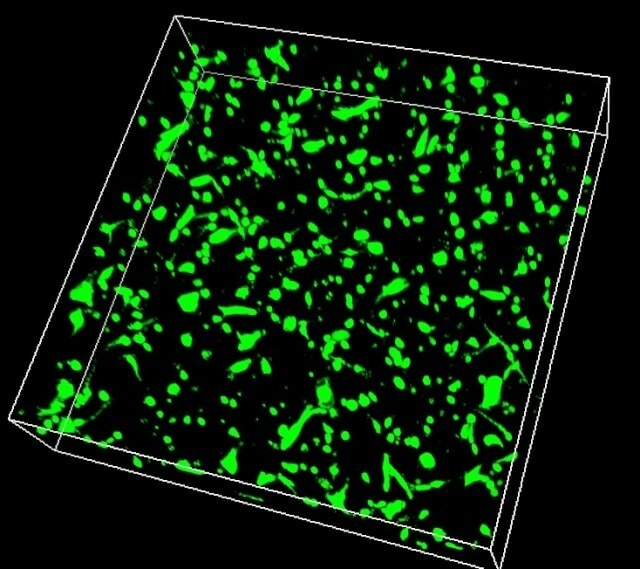 3D image of skin cells successfully growing in the biocompatible silk hydrogel. Source: Siwei Zhao. Tissue chips are a group of cells that emulate the physiology and anatomy of an organ or tissue and make it feasible to test lab-scale treatments in a more accurate way when compared to cells that are grown in a lone layer in a dish. In order to create a tissue beyond the body, the cells require a 3D structure to grow. These types of scaffolds are usually made of a silicon-based polymer called polydimethylsiloxane (PDMS) and include microfluidic chambers, representing respiratory tracts or blood vessels that run through them. The microfluidic systems provide several benefits. There are certain systems that are suitable for developing and testing lab-scale treatments. Some systems enable living cells to be implanted inside them, while others are capable of replicating different types of tissues such as bone and bone marrow. Yet there are other systems that exhibit qualities that enable them to be embedded within the body as part of the treatment itself; the ability to gradually degrade away is one such quality. However, existing biomaterials cannot perform these functions. Particularly, PDMS happens to be the most problematic as it is non-degradable and absorbs lipids like steroid hormones or fat molecules. Majority of promising medications are based on lipids. As a result, PDMS absorbs the lipids before their effects can be determined and thus makes it complicated to test drugs. A PDMS-based implant would be able to absorb lipids from the body, and as lipids are important to regulate the body’s function, it is not possible to implant a PDMS microchip in humans. In an effort to develop a system that meets all these requirements, the researchers eventually turned to silk - a naturally derived protein containing special properties. These properties provide a number of advantages such as varied levels of stiffness to match the tissue of interest; long-term stability in a wide range of conditions; ability to completely degrade over time; and a transparency that allows scientists to easily view biological processes such as enzymatic activity. We know that silk is biocompatible so you can use it even inside the body, and it can be programmed to dissolve over time safely. So this might even be an improved design that enables us to build little micro-tissues and make them implantable. The silk-based system was published in the Biomaterials journal. Scientists at the Department of Biomedical Engineering at Tufts University in Medford, Massachusetts designed a unique microfluidic device by combining silk into a gel solution and then casting it into a mold. The result was a rectangular slab of silk hydrogel with a 3D network of channels passing through it. The team also added mechanical valves to regulate the flow via the channels. Depending on the air pressure inside one of the chambers, the flow can be easily turned on or off. In living organs and tissues, interactions with proteins, enzymes, and other cells take place inside the tissue and also on the channels’ surface. To model these interactions, active enzymes and living cells have to be implanted inside the gel while it is being made. Conversely, adverse conditions needed to produce PDMS deactivate and kill the enzymes and cells. Since it is possible to create a silk hydrogel at ambient temperatures and under much more gentle conditions, it can contain enzymes and cells inside the gel and thus would be able to replicate the living tissues in a better way. Silk gels can tolerate a range of environments, such as variations in salinity and pH of the surrounding fluid without actually changing their shape or size. However, the gel’s stiffness can be controlled to match the target tissue’s properties – for instance, soft for brain or skin but harder for cartilage. The gels were also found to be clear, enabling easier analysis. Although the first application of the silk system would probably involve the testing of potential drugs, David Kaplan, Ph.D., senior author of the paper and Stern Family Professor of Engineering at Tufts University is excited regarding the possibility of growing tissues on chips that can be implanted within the body. “Silk takes you to the next level because it can be implanted and fully resorbed in vivo,” said Kaplan. For scientists looking for a system that can be customized to meet a particular requirement, whether it is cell signaling, mechanical pumps, or imaging of cellular processes inside the chip—this is it, said Kaplan. Silk is pretty unique in the ability to integrate everything into one material system. Now we can optimize systems in vitro (in cell culture) and directly translate that in vivo (within an animal) to look at tissue regeneration. I don’t know of any other system with the versatility that can do all that. The study was supported by grant EB002520 from the National Institute of Biomedical Imaging and Bioengineering (NIBIB). The Air Force Office of Scientific Research and the Department of Defense provided additional funding.